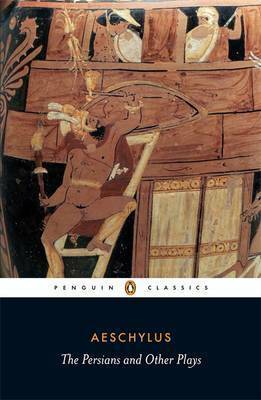 Aeschylus (525-456 BC) brought a new grandeur and epic sweep to the drama of classical Athens, raising it to the status of high art. "The Persians", the only Greek tragedy to deal with events from recent Athenian history, depicts the final defeat of Persia in the battle of Salamis, through the eyes of the Persian court of King Xerxes, becoming a tragic lesson in tyranny. In "Prometheus Bound", the defiant Titan Prometheus is brutally punished by Zeus for daring to improve the state of wretchedness and servitude in which mankind is kept. "Seven Against Thebes" shows the inexorable downfall of the last members of the cursed family of Oedipus, while "The Suppliants" relates the pursuit of the fifty daughters of Danaus by the fifty sons of Aegyptus, and their final rescue by a heroic king. Aeschylus (born at Eleusis, near Athens, c. 525 BC; died at gela, Sicily, 456 BC) was the dramatist who first made Athenian tragedy one of the world's great art forms, though in his epitaph he preferred that he should be remembered as one of those who fought the Persians at Marathon. Although he is said to have written over eighty plays, only seven have survived. Alan H. Sommerstein has been Professor of Greek at the University of Nottingham since 1988. He has written or edited more than thirty books on Ancient Greek language and literature, especially tragic and comic drama, including Aeschylean Tragedy (1996), Greek Drama and Dramatists (2002), and a complete edition of the comedies of Aristophanes with translation and commentary (1980-2003).